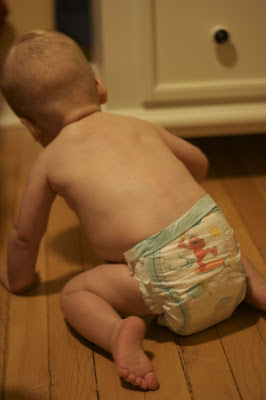 I've blogged several times about my love for cloth diapers and their wonderful money-saving potential. But, a couple of weeks ago, I had to say goodbye to the cloth. Now I am remembering how I touted the benefits and claimed that I might not "ever" use disposables - oh, if only I had known that pregnancy #2 was just around the corner! Yep, pregnancy #2 has been filled with nausea, fatigue, and overall yuckiness. I decided that dumping baby poop in the toilet was just one thing I could do without. So I sucked it up and went to Target to plunk down a chunk of change for the disposables. And I have been in diaper heaven ever since. Overall, I loved the cloth when Alex was younger. I will probably use them on Baby #2 for the first year too. But when baby poop becomes like big people poop, frankly, it's yucky. Real yucky. I know that all the cloth diaper blogs I read suggested that you will just dump the poop in the toilet and then put the diaper in the dirty bin. But you know what? My kid's poop never just plunked into the toilet. Ever. It usually involved shaking the diaper (which usually resulted in a poop-splatted toilet), or worse, dipping it in the toilet. Oh, and did I mention that my kid poops 3-5 times a day? (Yes...he's all boy.) Now, I was willing to handle this for a few months with a good attitude. But then when pregnancy came along, and I could smell the neighbors' chopped onions from 2 floors down - with the windows and doors closed! - I knew it was time to make a change concerning the diapers. My super sonic nose and my stomach simply refused to handle the cloth diaper situation. So we made a change. Now we are all happier and my toilet is clean. So, this post is to give major kudos to all you real-deal cloth diapering moms. I tried. And I may try again. But honestly, I'll never measure up to all you gals who are willing do the really dirty work. Kudos to you Greenies and Money-Saving Mommies! If you used cloth to be environmentally friendly, then you've still done awesome just by saving the first year or so of disposables. The real food = real poop = real yucky definitely changes things!! I was sick for the first 4 1/2 months of this pregnancy and while we've always use disposables I TOTALLY sympathize with the preggo sickness and diapers don't mix feeling.